RecipeTips.com's video demonstration, 'No-mess Bacon,' demonstrates how to cook bacon for a quick clean up. Hi! This is Laurie from RecipeTips.com. Here is a great idea in order to cook your bacon free of splatters and mess. 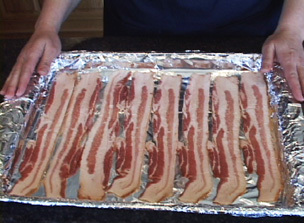 Line your baking sheet with aluminum foil, and then just lay your bacon out in a single layer. Then place it in a 350 degree preheated oven for about twenty minutes or until it is done to your liking. When the bacon is done, just remove it from the pan, and allow the grease to cool slightly; then cleanup is a breeze: just remove the tinfoil from the pan, roll it up, and throw everything away. For more information on bacon, go to RecipeTips.com.